Humidity is the measure of water vapor in the air. The greater amount of water in the air means higher amounts of humidity. 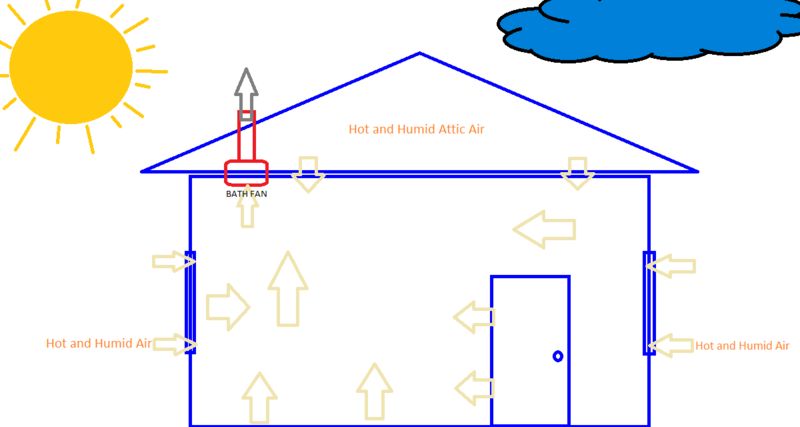 What can cause high humidity in homes? North Central Florida is well known for high levels of humidity in the outside air. The last place you expect to be humid is your home or office. Air conditioners sold in the Florida market are designed to condition the air prior to being supplied into the building, and some air conditioners are better designed to dehumidify the indoor air. The amount of moisture in the air can be at high levels based on the home’s air infiltration, positive or negative pressure, and possibly needed repairs or improper operation with the home comfort system. These factors can cause the home to draw in hot and humid air from outside leading to a sick building. Windows and doors can be poorly sealed or aged that allow hot and humid air inside the home. Infiltration, or the introduction of outside air into a home, happens each time you open and close one of those doors or windows. Air leakage can also infiltrate the home through cracks and spaces in the building envelope. If there’s hot and humid air outside, then it now has a way to get inside your home even if your air conditioner is running. This means the air conditioner has to work even harder to cool your home to the desired temperature setting. If the air conditioner isn’t designed to remove high levels of humidity, then you’re only recycling the same humid air that’s been pulled in from outside. This is not as common as the other causes of high humidity, but an older home may have aged shingles that allow water into a wall cavity and seep into the building envelope. Combine this with negative pressure in the home and there’s the potential for larger amounts of microbial growth. Negative pressure is when the home or building has lower pressure than the area surrounding it. This negative pressure is what allows air to be “pulled” inside. There are home appliances that can naturally create a negative pressure when the appliance is turned on. Bath fans, hood exhaust, and the most common cause of negative pressure is the clothes dryer (as seen in Figures 1 & 2). When these appliances are activated, they remove air from the home which creates a negative pressure to invite outside air from other sources like windows, doors, and cracks in the building envelope. The Florida climate carries a large amount of moisture in the air. 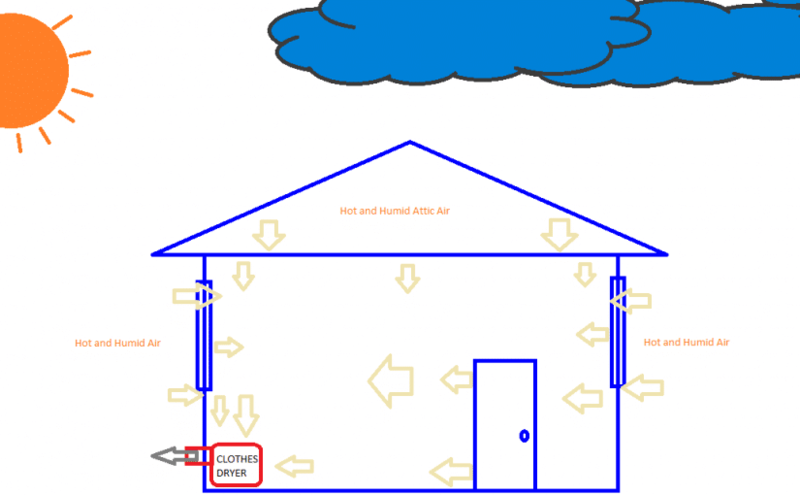 If that humid air is pulled into the home from the negative pressure inside, it has the ability to travel through the wall structure to the interior of your home. A proper design of your HVAC equipment, pressurization, and selecting the right equipment to adequately dehumidify and filter the air are all important steps to take to prevent moisture accumulation. 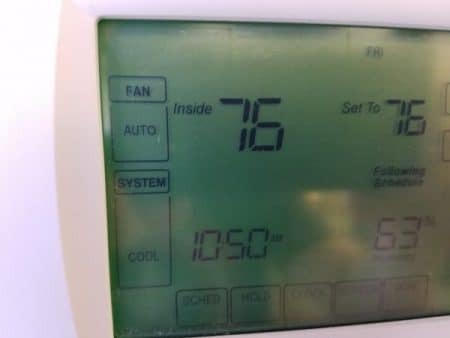 If an air conditioner’s runtime is not long enough to remove humidity, then it will only satisfy the temperature setting on the thermostat. This is called short-cycling. Air conditioners should cycle for at least 15-20 minutes to begin dehumidification. Proper sizing of the air conditioning equipment to remove humidity from the home is equally important. 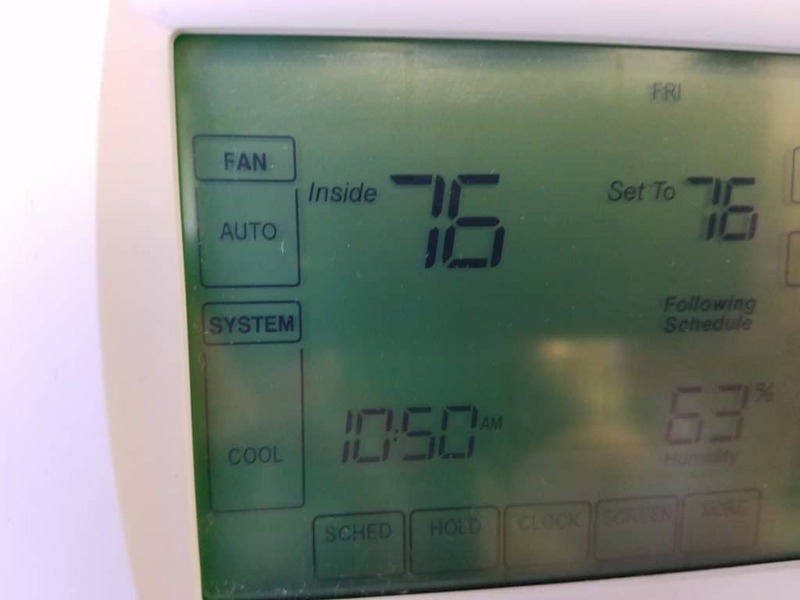 An aged system that isn’t properly maintained may have trouble removing humidity as well as a system that wasn’t installed to manufacturer’s specifications. Annual preventative maintenance allows your HVAC contractor to monitor the performance of the home comfort system and address any concerns with high humidity. These recommendations are intended to educate the homeowner for causes of high humidity. Please contact Bertie Heating & Air Conditioning to schedule a service repair if you have any concerns with microbial growth and humidity inside of your home.